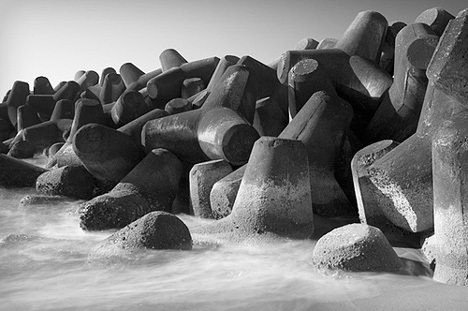 Hit the beach anywhere in Japan, and you are likely to see endless piles of tetrapods -- enormous four-legged concrete structures intended to prevent coastal erosion. 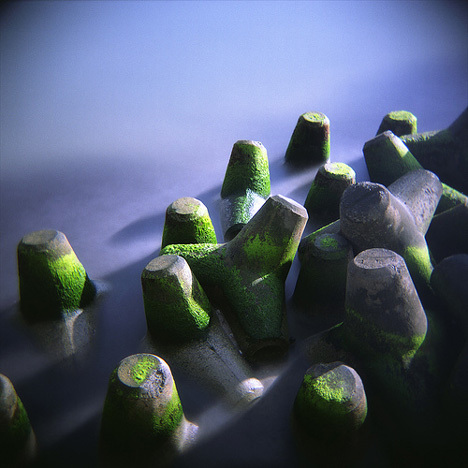 By some estimates, more than 50% of Japan�s 35,000-kilometer (22,000-mi) coastline has been altered with tetrapods and other forms of concrete. Critics, who blame the tetrapod invasion on decades of excessive government spending designed to bolster the construction industry, argue that in addition to posing a danger to swimmers, surfers and boaters, tetrapods actually accelerate beach erosion by disrupting the natural processes that shape the coastal environment. 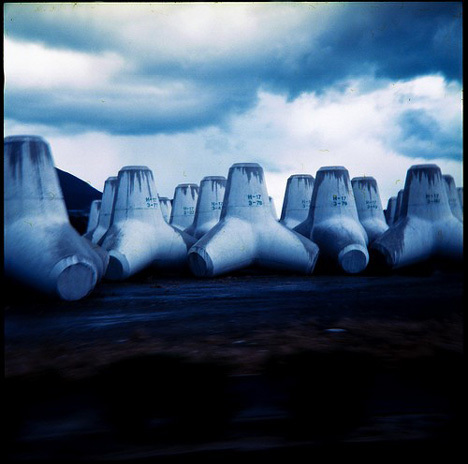 Meanwhile, others have developed an aesthetic appreciation of the tetrapod landscape, as evidenced by a host of stunning Japanese tetrapod photos on Flickr. Great post! The pictures are amazing. 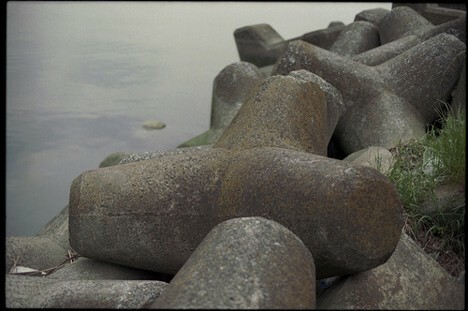 I remember seeing those odd tetrapods along the coast in Shimizu and being really intrigued with them. While strangely beautiful in some way I can also appreciate peoples distaste for them. What an amazing collection of pictures here. 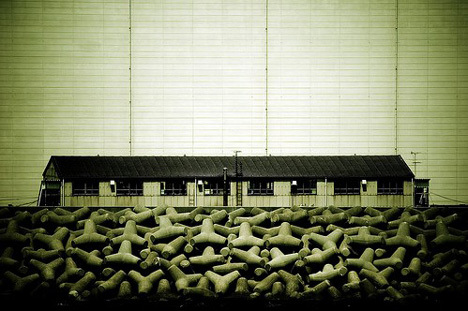 These tetrapods look like an alien army conquering our coasts... Great! Wow! Just think how much of Japan would still be left if they had had those tetrapods back in the Jomon period. scary how beautiful these can be. Nice roundup! 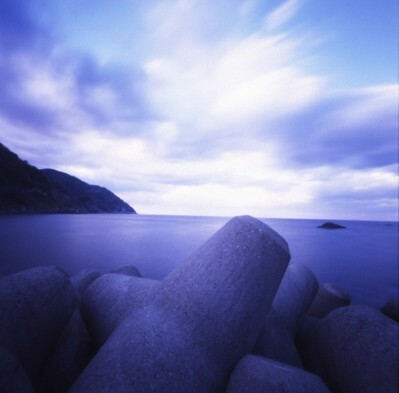 Most Japanese coasts are covered with these. That's why when people come here and ask about going to "the ocean" I tell them it's like going to a concrete factory! isn't more about repelling an invading army by sea? 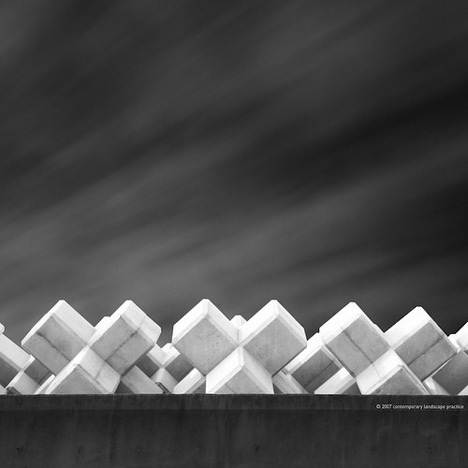 I never thought those concrete things would look beautiful!! Another truth is that those tetrapods are favored by many anglers since the tetrapods increase the crab population drastically which lure snappers and many other fish. Basically the tetrapods become a great habitat for sea creatures. But recently some places (e.g. Beppu in Kyushu) started projects to remove the tetrapods and put the shore back to the original state by adopting some new tsunami-wave blockers placed under water away from the beach. Btw, there are still many beautiful natural beaches in Japan (You just have to go off the beaten tracks). For amazingly beautiful Japanese beaches, check the photos by these guys (their photos are published on National Geographic). We've got 'em where I live (Isle of Wight). How ugly what a way to mess up a coastline. 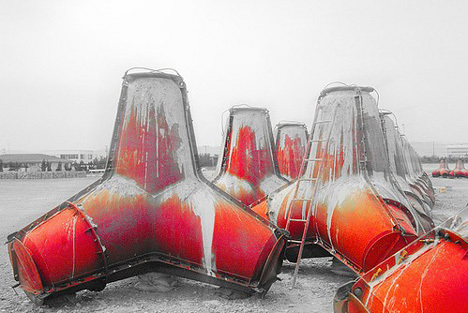 Can you share the drawings/dimension of a 2 tonne steel molds for concrete tetrapod? 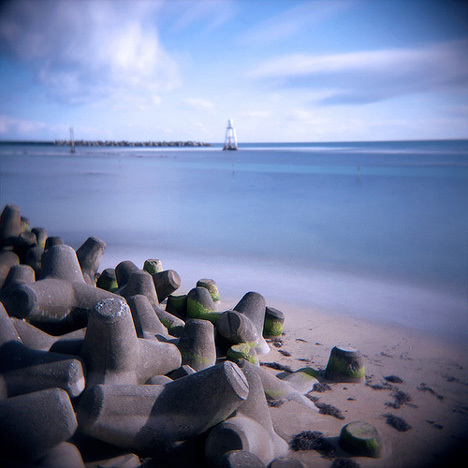 I find the tetrapods an eyesore. They look terrible and they collect a ton of trash that no one ever cleans up. I live in Okinawa and an incredible amount of formerly beautiful coastline has been lost to tetrapods and other concrete atrocities. It’s not just the coastline that is being destroyed with concrete structures; pretty much the entire southern half of Okinawa is pure concrete with the occasional tree thrown in. It’s quite hypocritical that Japan is making a big deal over the proposed Henoko air field for the US military because of environmental concerns when the Japanese have no problems dumping concrete in to the ocean elsewhere with no regard to the environment where the US military is not involved. Totally agree, concrete should not be used, for environmental reasons. Total waste of energy and CO2. Don't they have any natural rocks? Besides, it looks awful, like the war efforts to keep tanks out. Wrong terminology I think. A tetrapod is something with four feet. These shapes are called a caltrop. Here can you see more of them in North Norway. What a waste of materials.. 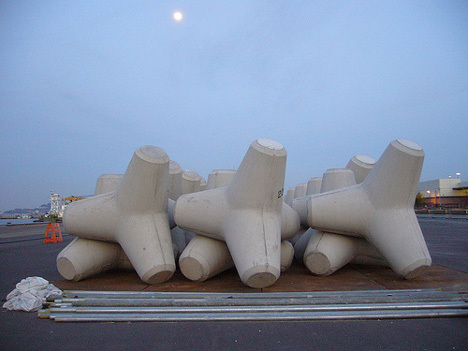 Recently I did research on these tetrapods and I found out that it costs almost a half million yen ($6,000 USD) to deploy just ONE piece! Japan's coastline is the 6th longest in the world, even longer than USA and Australia so deploying these for 50% of the coastline was a huge spending. Such a large amount of spending is not just the result of the 1960-1990's corruption between the local government and construction companies, but also many local people living by these coasts did support it (believed in the effectiveness) since they had been scared of fierce typhoons and tsunami for many centuries. Japan is very prone to typhoons and tsunami (25% of the world's earthquakes happen in Japan. There are reasons why the Japanese word "tsunami" became international), and Japan is 75% covered in steep mountains so many people have been living near the coast. The other 50% of the coastline are either protected by the government or far from inhabited areas, and many of these protected beaches are gorgeous (even for me coming from Australia), which I think is a typical Japanese thing = where protected, they protect very well, otherwise they don't care. 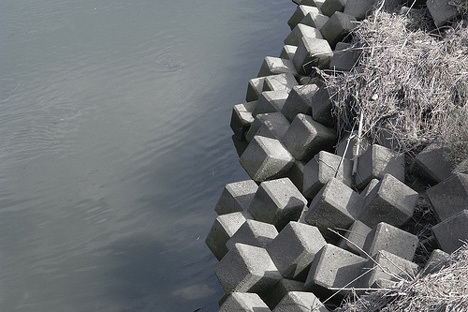 However, many municipalities in Japan started to admit the problems of these concrete blocks and in compliance with the landscape law and the new biodiversity law, there have been many cases of removing tetrapods in the last few years. The tetrapod removal in Toyohashi (Aichi Prefecture) brought back many sea turtles coming to lay eggs, which became a case study model for the other municipalities. What's the fuss? They're obviously godzilla caltrops! The tetrapodes were used about 1959- 1970 in Berlevåg, Northern Norway, at 70 degrees north. The were used to protect this little fishing port. The village has a fabulous live webcamera at "berlevaagnytt.com". And the tetrapodes have an important role, and the shocking opening frames of a film called "Heftig og Begeistret" from about the year 2000. 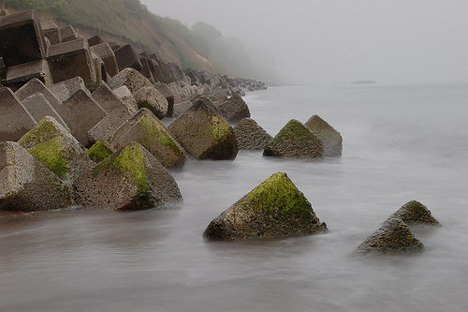 The tetrapods found in Romania have a very interesting geometric configuration and also offer much more stability than those presented above. They have them in Santa Cruz, CA. We have a beach where they just used granite boulders and they came loose and roll around on the ocean floor by the beach now. There's a surfer who hangs about who has a huge scar on his face from getting sucked under one of them. So they may not be as pretty as the natural coastline, but we have a highly erosional coast in our bay and these "tetrapods" never come loose like those boulders. I'm not a geologist, but the last photo seems to indicate sediment capture by the tetrapods, nearly proving the effect of the tetrapods at keeping the island geographically intact, though I wonder how long and will be the likely consequences of concrete failure over time. And to the point of the author's commentary, this should definitely have been done by private property owners rather through the threat of violence (read: government), even if proven extremely effective. Most likely it would have been done more efficiently and with less environmental impact as well. I don't like the tetrapods, especially because they disrupt the natural way of beaches and ocean waves. 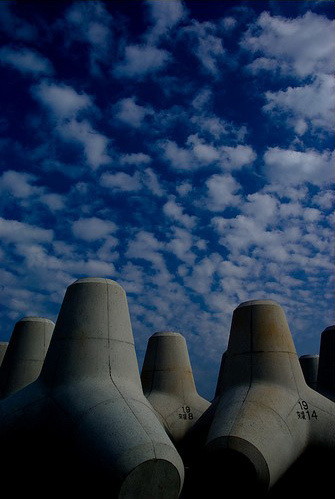 Interesting debate re these concrete Tetrapods, of aesthetic form versus function. The bottom line is, we all acknowledge that they're NOT natural. But then again, Tsunamis are perfectly natural and also devastatingly deadly. The question then becomes do we outweigh natural beauty with a protective barrier (however minimally effective) in order to save lives from what is admittedly a pretty predictable regional catastrophic event(s)? Yes, they're an eye sore to some, but if they could collectively save lives, I would vote for the hard barriers. C-MONSTER.net. » Blog Archive » The Digest. 08.12.08. For no one » ?????? » ??????? ?